This was waiting for me yesterday in a giant pile of mail that accumulated while we were away on vacation. Boy, was the Postmaster happy to see me. 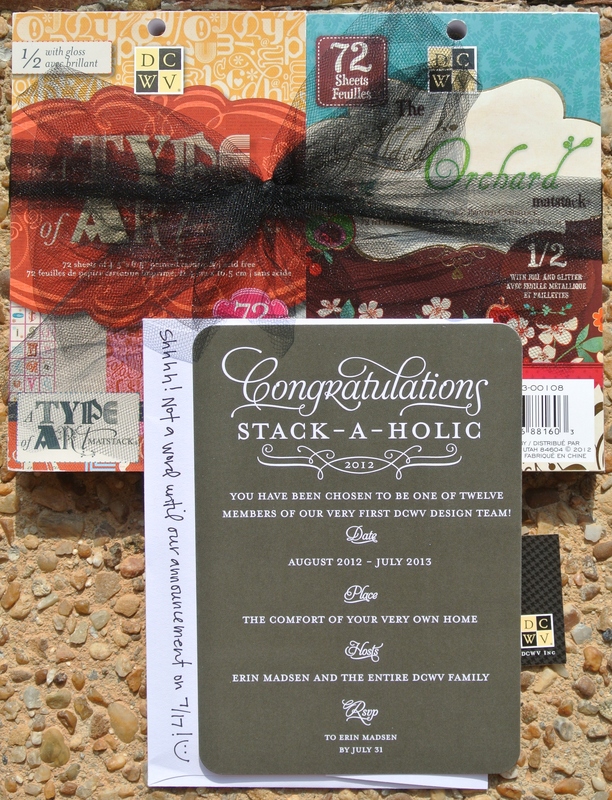 But, not as happy as I was to see a package from Erin Madsen, the Queen of Stack-a-Holics. I am beyond excited to have been selected to be a member of the DCWV Stack-a-Holic Design Team. And a tad bit nervous too. I can’t wait to begin this journey with DCWV, and I’ll hope you’ll join me! And let’s face it, this was SO much better than the American Express bill that was waiting on me too. I think this is super news. Congrats. Wow – you totally have earned this seat on the design team. Your projects and blog skills are at the top – great job! Congratulations and enjoy it! Congrats! Can’t wait to see all of your creations! Congrats Sara! Isn’t this an exciting time! Looking forward to working with you! Congrats, Sara! I love your projects– can’t wait to see what’s next!! Congratulations Sara! I am looking forward to working with you! Congratulations Sara! Wow how exciting..
Congrats to you!!!!!! How exciting and what an honor for you!!! Congratulations! I’m looking forward to working with you! Thanks for commenting on my card! Talk to you later! Congratulations! I’m looking forward to working with you! Thanks for commenting on my card. Talk to you later!